This easy Tomato Basil Soup with Parmesan is loaded with veggies and can be prepared on the stove top or crockpot. Simple, healthy and delicious! One of the ways we try to save money on groceries is by eating at least one meatless meal a week. We love our meat, so I’m always excited when I can find meatless recipes that are so good and full of flavor that we don’t even think about the fact that we’re not eating any meat. 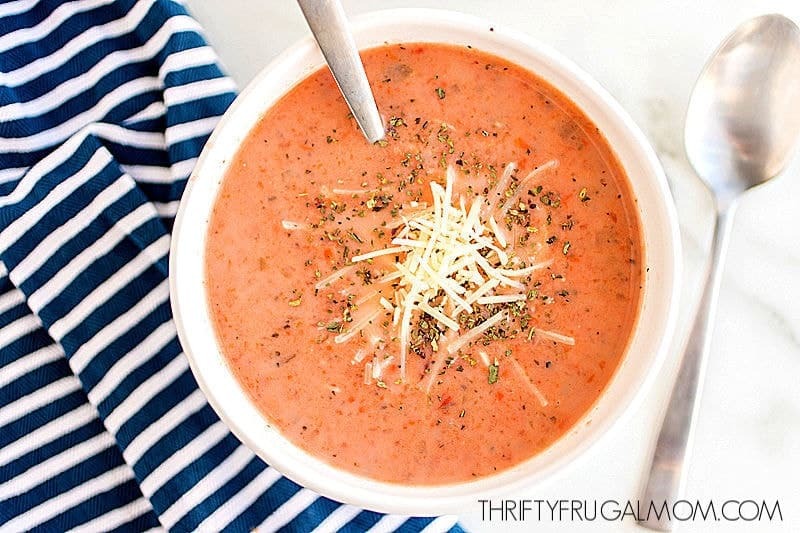 This Tomato Basil Parmesan Soup is one of those recipes! I discovered this recipe last fall and it has become a regular around here. It’s super easy to make which is a win for anyone, right? On days that I plan ahead well, I love the convenience of making this Easy Tomato Basil Soup in my crockpot. And those days where I’m a little more helter-skelter but need something quick to make for dinner, I just adjust the recipe and make it on my stove top. 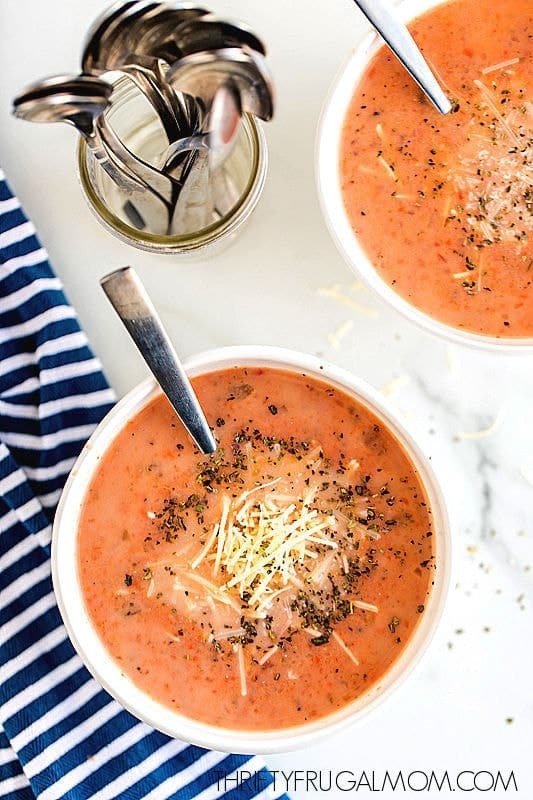 The Parmesan cheese, milk and butter make this tomato basil soup just a bit creamy, and the chicken broth adds a nice depth of flavor. I love too that it’s full of veggies and yet my kids are happy to eat it. Since we aren’t crazy about big chunks of tomatoes I lightly blend it with my hand blender, and we think it makes it the perfect consistency. Add some Classic French Bread and a Simple Lettuce Salad with Homemade Dressing and you have yourself a delicious, simple meal! 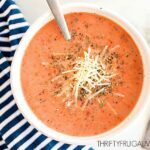 This easy Tomato Basil Parmesan Soup is loaded with veggies and can be prepared on the stove top or crockpot. Simple, healthy and delicious! Add tomatoes, celery, carrots, onions, oregano, basil, bay leaf and chicken broth to a large slow cooker. About 30 minutes before serving prepare a roux by melting butter over low heat and then adding flour. Stir constantly with a whisk for 5-7 minutes. Slowly stir in 1 cup hot soup. Add another 3 cups and stir until smooth. Add all back into the slow cooker. Stir and add the Parmesan cheese, warmed milk, salt and pepper. Combine first 8 ingredients in large pot. Cook until veggies are soft. Make roux as instructed and add to soup. Recipe adapted from Today’s Mama. This recipe looks yummy! I just have one question. I have some tomatoes that I canned last year that I would like to use for this recipe. I canned them in halves. Would I toss the liquid or use it? I was in a hurry and didnt read properly needless to say I for some reason added it all to the crock pot at once including the flour and butter. Just realized this a few hours in and well I hope it is still good (probably not). Dang, we will see how it turns out. Pretty upset at myself. Oh that's so frustrating, Brittney! I've done similar things before when I was trying to hurry...and occasionally when I just got distracted in the middle of cooking. :( I wonder how it worked out for you. I'm guessing it was pretty thick and possibly stuck to the "pan". My one thought was that maybe you could add more tomatoes and/or milk to thin it and then blend it somehow to try to salvage it? I'm so sorry! I do a lot of canning, but I have never tried canning this soup before. I don't think canning milk based items is recommended though, however, you could probably just mix up everything but the flour, cheese, butter and milk and can that and then just add that part when you go to make the soup. But I don't know how long you'd need to can it! Maybe as long as other tomato products? Not sure! I made this soup today and it was yummy. I added a Parmesan rind in the slow cooker with the fresh vegetables rather than after and the flavor was really rich. Great with grilled cheese sandwiches. Oh, I bet that Parmesan rind made it extra delicious! And yes, we love this with grilled cheese too. Such comfort food! Thanks for stopping back to let me know that you loved it!